This is my very first ATC. I just dont know why Ive never ventured into the world of ATC's or even thought of making these tiny cards before. They are soooo much fun, quick and super easy. It is colored in with glitter gel markers, SU signo gel pen, watercolor pencils. like the last one, this one is also embellised with silver brads and popped with foam dimensionals. I love this fun HM stamp because it can used for various occasions like New Year's, or a Birthday, or a Celebration, or a 'Just Because' type of a card. 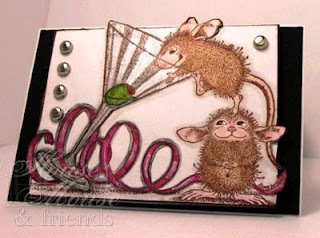 This Stampabilities House Mouse stamp is called "Olive A Party!" from 1995 and it's of Maxwell & Mudpie # MHUR1005. Come have FUN playing along with us at.... http://housemouse-challenge.blogspot.com/. To motivate you a little more this week, there is also a prize to be won from ***The Rubber Cafe***! It was originally scheduled for this past week, but I missed that it was postponed. It will now be given away for HM challenge week of the 19th. I do apologize for any confusion this may have caused you and hope you will join us again this coming week to try to win it. This is so cute!! I haven't seen that image before. What fun! This is totally cute, you know I love it! Great idea with the brads down the side too. Oooh, I love this stamp! So fun! Great coloing. I need to make an ATC too! Fabulous ATC! Love your coloring.